At home wedding receptions can benefit from pool covers as well. Many times, the bride’s family will have a pool cover installed when the reception is to take place in the home. Not only does a rental pool cover allow additional space for guests, it also keeps younger guests from exploring (and possibly, falling in to) the edges of the pool. 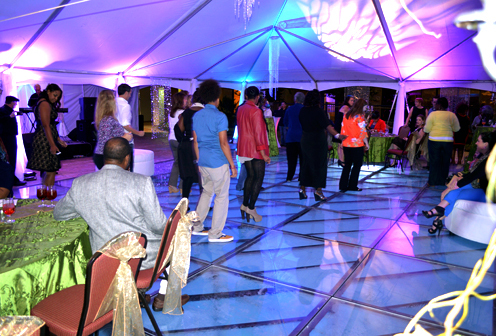 Corporate clients as well as family clients can both benefit from using swimming pool covers as dance floors. Imagine an effect where your guests appear to be dancing on the surface of the pool and you’ll see why a see-through acrylic pool cover provides your guests with a truly unique experience. The three types of flooring available for rental swimming pool covers. Swimming pool covers can be customized by changing the actual surface of the flooring. Below you’ll find the surface options available for swimming pool covers. Wood Surface – most wood topped swimming pool covers have a black surface, although vendors can provide a white wood surface or other color to client specifications. This is the most cost effective option for rental swimming pool covers. Frosted Acrylic Surface – this surface consists of a semi-opaque acrylic. It allows light to project up from the pool to the floor itself. This surface is best suited for cocktail and casual atmospheres. Clear Acrylic Surface – this flooring type is used in black tie and elegant events. The surface is completely clear, allowing guests to be able to see through the floor into the pool. 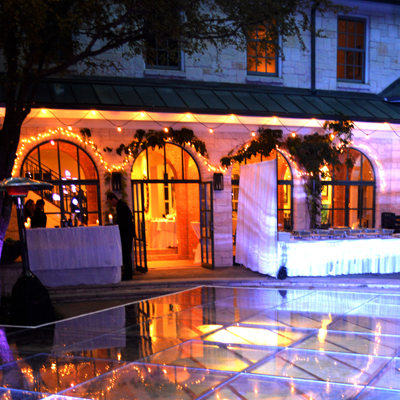 This clear acrylic swimming pool cover was used at the grand opening of a hotel. NEW – Flush Mount pool cover rentals – With the previous three types of surfaces, pool covers had to built up over the surface of the swimming pool which creates a “step up” onto the floor. No more! In Depth Events can now provide a flush mount swimming pool cover. This means that the swimming pool cover is inset in the pool and custom made to be at the same height of the pool surround. Take a look at this blog post for Flush Mount Pool Covers to see how a custom pool cover might benefit your event! At In Depth Events, we are swimming pool cover experts with experience doing LOTS of them all over the United States! In addition to providing wood or acrylic swimming pool covers, we can also provide the decor lighting, audio needs and other production elements your clients demand. Make sure and Ask Us a Question about how a swimming pool cover can add to your next event. We look forward to hearing from you and working with you!